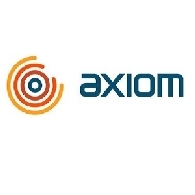 Axiom Mining Limited (ASX:AVQ) focuses on tapping into the resource potential within the ore-rich Pacific Rim. Through dedication to forging strong bonds and relationships with the local communities and governments where we operate, Axiom Mining has built a diversified portfolio of exploration tenements in the Asia-Pacific region. This includes a majority interest in part of the Isabel Nickel Project in the Solomon Islands and highly prospective gold, silver and copper tenements in Solomon Islands and North Queensland, Australia. Axiom Mining is listed on the ASX. Axiom Mining Limited (ASX:AVQ) is pleased to announce that the Minister for Mines on behalf of the Solomon Islands Government has formally granted Axiom&apos;s subsidiary, Axiom KB Limited, the Mining Lease over the San Jorge nickel deposit, part of the world class Isabel Nickel Project. Axiom Mining Limited (ASX:AVQ) is pleased to announce further significant results from the resource definition drilling program on the Isabel Nickel Project in Solomon Islands. 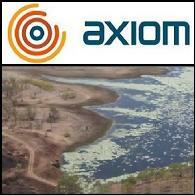 Axiom Mining Limited (ASX:AVQ) is pleased to announce the appointment of Mr Paul Frederiks as Company Secretary (Local Agent), effective 21 August 2015. Axiom Mining Limited (ASX:AVQ) is pleased to announce outstanding first results from the resource definition drilling program on the Isabel Nickel Project in Solomon Islands. 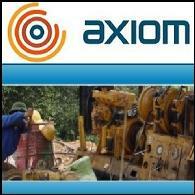 Axiom Mining Limited (ASX:AVQ) had excellent results from the drilling program during the quarter. The company recorded a total of 129 holes with an aggregate of 2236m using one drilling rig, and consistently intercepted high grade nickel mineralisation especially at the prospect areas of Havihua and Kolosori Ridges. 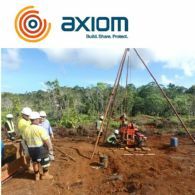 Axiom Mining Limited (ASX:AVQ) has completed a technical review of recent and historical work at its West Guadalcanal Project in Solomon Islands. Axiom Mining Limited (ASX:AVQ) is pleased to announce the appointment of a new Board member and two executives to strengthen commercial and technical capabilities as the Company continues to make the transition from explorer to producer. Axiom Mining Limited (ASX:AVQ) is pleased to advise $5 million has been raised through a private placement (&apos;Placement&apos;) of shares to fund the ongoing development of Isabel Nickel Project in Solomon Islands. Axiom Mining Limited (ASX:AVQ) wishes to advise that Axiom KB Limited was invited by the Solomon Islands Government to present a Mining Lease Application (MLA) for the Isabel Nickel Project, to be determined at the Mines and Minerals Board meeting on 16 July 2015. Axiom Mining Limited (ASX:AVQ) is pleased to announce the successful completion of its orientation drilling program on the Isabel Nickel Project in Solomon Islands.